MOSUL, Iraq (AP) — For nearly 2½ miles along the western bank of the Tigris River, hardly a single building is intact. The warren of narrow streets of Mosul’s Old City is a crumpled landscape of broken concrete and metal. Every acre is weighed down by more than 3,000 tons of rubble, much of it laced with explosives and unexploded ordnance. It will take years to haul away the wreckage, and this is just one corner of the destruction. The Iraqi military and U.S.-led coalition succeeded in uprooting the Islamic State group across the country, but the cost of victory is nearly incalculable. Three years of war devastated much of northern and western Iraq. Baghdad estimates $100 billion is needed nationwide to rebuild. Local leaders in Mosul, the biggest city held by IS, say that amount is needed to rehabilitate their city alone. So far no one is offering to foot the bill. The Trump administration has told the Iraqis it won’t pay for a massive reconstruction drive. Iraq hopes Saudi Arabia and other Gulf countries will step up, and Iran may also take a role. The U.N. is repairing some infrastructure in nearly two dozen towns and cities around Iraq, but funding for it is a fraction of what will be needed. As a result, much of the rebuilding that has happened has come from individuals using personal savings to salvage homes and shops as best they can. Nearly every city or town in former IS territory needs repair to one degree or another. The longer it takes, the longer many of those who fled IS or the fighting remain uprooted. While 2.7 million Iraqis have returned to lands seized back from the militants, more than 3 million others cannot and they languish in camps. 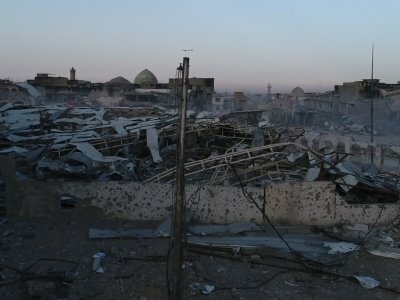 Worst hit is Mosul; the U.N. estimates 40,000 homes there need to be rebuilt or restored, and some 600,000 residents have been unable to return to the city, once home to around 2 million people. Corruption and bitter sectarian divisions make things even harder. The areas with the worst destruction are largely Sunni, while the Baghdad government is Shiite-dominated. The fear is that if Sunni populations feel they’ve been abandoned and left to fend for themselves in shattered cities, the resentment will feed the next generation of militants. “The responsibility to pay for reconstruction falls with the international community,” said Abdulsattar al-Habu, the director of Mosul municipality and reconstruction adviser to Nineveh province, where the city is located. Mosul’s Old City paid the price for the Islamic State group’s last stand. Streets are now knee-deep in rubble from destroyed homes. The few high buildings of six or seven stories have been blasted hollow, reduced to concrete frames. Shopping centers and office buildings are pancaked slabs. Almost all that is left of the 850-year-old al-Nuri mosque, blown up by IS fighters as they fled, is the stump of its famed minaret. At the southern end of the district, the arcades of stone-arched storefronts in the historic bazaars that once sold spices, cloth and household goods are charred and gutted. Eaves that once shaded shoppers look like they were hurled into the air to land as mangled metal scattered across the cityscape. At the northern end just outside the Old City, some buildings have been blown to splinters and piles of dirt in a large medical compound that housed the College of Medicine and the Jomhouriya Hospital. The following message will be displayed to users with unsupported browsers: Your browser does not support the iframe HTML tag. Try viewing this in a modern browser like Chrome, Safari, Firefox or Internet Explorer 9 or later. All five bridges crossing the Tigris have been disabled by airstrikes, forcing all traffic onto a single-lane temporary span linking east and west. A debris field the same size in New York City would run from the 9/11 Memorial nearly to 18th Street and cover nearly a quarter of Manhattan south of Central Park. There were effectively two battles for Mosul. The first, from October to February, freed the city’s east, which survived largely intact. The second pulverized the west side. There, IS dug in and the Iraqis and U.S.-led coalition upped their firepower, culminating in house-to-house fighting in the Old City. The city, which IS overran in the summer of 2014, was declared liberated in July. An Associated Press investigation found at least 9,000 civilians died in the assault to retake Mosul, most in the west. The Old City shows the densest destruction, but nearly every neighborhood of western Mosul has blocks of blasted houses, industrial areas, government buildings and infrastructure. It’s been more than a generation since the last comparable fight to seize a city. Military experts compare the assaults on Mosul and IS-held Raqqa in Syria to the devastating 1968 battle for the Vietnamese city of Hue. Some look even further back. “All I can think of is Dresden, or pictures I’ve seen of World War II,” said Stephen Wood, a senior analyst at the satellite imagery firm DigitalGlobe. Along the Old City’s gutted roads, a handful of people are beginning to rebuild. Amar Ismail Brahim sold his wife’s gold to repaint his cafe. He didn’t bother asking for government aid. Brahim ultimately blames the Islamic State group for the destruction, but he believes the obligation of reconstruction lies with the United States and other Western countries. The enormity of the task ahead in Mosul can be grasped by what has — and hasn’t — happened in Ramadi , the capital of Iraq’s western Anbar province. Two years after it was retaken from IS, more than 70 percent of the city remains damaged or destroyed, according to the provincial council. Nearly 8,300 homes — almost a third of the houses in the city — were destroyed or suffered major damage, according to UN Habitat. All five of Ramadi’s bridges over the Euphrates River were damaged; only three are currently under repair. Three-quarters of the schools remain out of commission. The Anbar provincial council holds its meetings in a small building down the street from the pile of rubble that was once its offices. Nearly all of Ramadi’s government buildings were blown up by the militants. “We haven’t received a single dollar in reconstruction money from Baghdad,” said Ahmed Shaker, a council member. “When we ask the government for money to rebuild, they said: ’Help yourself, go ask your friends in the Gulf” — a reference to fellow Sunnis. So people in Ramadi borrow, beg and compromise. Halayl Sharqii and his wife Hanna returned in 2016 and found their house destroyed. “All I remember doing is picking up the pieces of our furniture in a blanket,” said the 75-year-old Halayl. Like most of their neighbors, they borrowed money from extended family to partially rebuild their modest two-room house. A Qatari aid organization helped fix the roof of one room. All around, other houses are in similar states of semi-repair; on one home, bullet-holes are patched up with cement, while its neighbor is still missing walls. Weeds are thick in neglected gardens around damaged homes that remain abandoned. On one street corner, children clamber up a collapsed apartment building and pick through the rubble. The former residents pay them 1,000 Iraqi dinars (a little less than a U.S. dollar) for each family photograph or identification document they retrieve from the dust and concrete. Most of Ramadi’s pre-IS population of around a half million has returned. Restaurants and shops are reopening along main streets, and traffic churns through scores of checkpoints. Iraqi officials cite that as a sign of success. But like many others, the Sharqiis’ decision to return was out of desperation, not hope. Their savings were drained and they wore out their welcome in a crowded home with extended family in Baghdad. “We had no other choice but to return,” Halayl said. The main engine for rebuilding has been the stabilization program run by the U.N. development agency, known as UNDP, which focuses on rehabilitating infrastructure, including roads, water and electricity systems and schools, as well as some homes. Its daily project notices are ambitious. To clear debris from Mosul’s riverbank neighborhood of al-Madain, a single contractor must have three heavy-duty shovels, six mini dump trucks, six tractor-trailers, two excavators and 2 tons of black trash bags. The timeframe: 45 days. Workers must be locals and must earn no less than $20 a day. But funding is far lower than what Iraq says it needs. So far, stabilization has received some $392 million in contributions. The United States has given the lion’s share, some $115 million. Germany is the second biggest donor at $64 million. The United Arab Emirates and Kuwait are also contributing, but no other Gulf nations are among the list of donors. Overall, Washington has contributed $265 million to reconstruction since 2014, on top of $1.7 billion in humanitarian assistance in Iraq. That is a fraction of the $14.3 billion that the U.S. spent in fighting the Islamic State group in Iraq and Syria. The official said many in Washington believe past efforts in Iraq didn’t yield adequate returns and there is little appetite for large international reconstruction projects. After the 2003 toppling of Saddam Hussein, the U.S. pumped $60 billion over nine years into Iraqi reconstruction. Critics say the money did little to prevent political disarray and the rise of militants in Iraq. About $8 billion dollars of it was wasted through corruption and mismanagement, according to the U.S. special inspector general for Iraq reconstruction. Douglas Silliman, the U.S. ambassador to Iraq, blamed the destruction of Iraqi cities squarely on IS fighters. “Had they not been here, had they not conducted a completely brutal and inhumane campaign against the Iraqi people, this destruction would not have happened,” he said. The answer to that could be new militants, Iran or Russia, he said.